1968 O'Day Sailboats Brochure — O'Day Mariner #1922 "Orion"
Thanks to Paul Gjenvick at Gjenvick-Gjønvik Archives for permission to use these pictures. Unfortunately, there are no high-resolution images besides what appears when you click on each picture, although most of these shots are featured in the previous year's catalog. 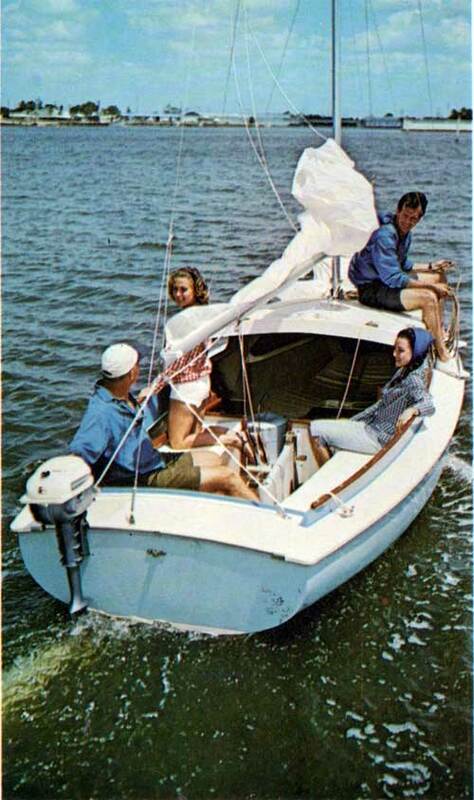 Mariner might be the roomiest 19-footer afloat... a happy combination of day sailer, racer and overnight cruiser. The perfect balance between her proven hull design and seven-eighths sail plan provide maneuverability, speed and ease of handling seldom found in a boat that's comfortable for six by day and equipped to cruise four. All lines and headsails are handled from the cockpit - an advantage for the novice maneuvering in small areas. A simple boom tent converts the cockpit to sleep two, and there are two full-sized berths below. Mariner is available with 415-lb. keel or centerboard with 200 lbs. of inside lead ballast. Both models are easily trailed; on person can launch her ad step the mast.